Winter is not over yet. Although the days are becoming noticeably longer, it's still very chilly overnight, and I know from experience that it's quite possible for us to be faced with frost well into September before we can say for sure that the cold weather has finished for this year. A large percentage of New South Wales is in severe drought, having received in some areas, less than half the average yearly rainfall to date, and the outlook for rain is grim. The State Government drought assistance package is now over $1 billion in an effort to bring drought relief to those on the land, and people from the city and the country have been donating money for feed. On our recent trip, we saw massive loads of hay bales being trucked from as far away as South Australia to needy farmers further north. The situation is dire. Despite the cold and lack of decent rain, there are some signs of Spring and my post this Saturday is about those early stirrings in the garden beds. 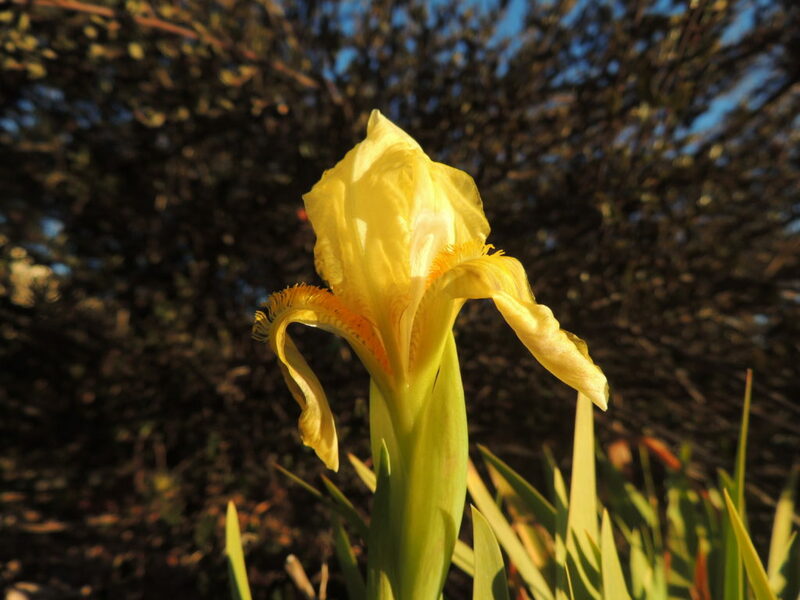 One: Yellow Iris, given to me by a friend. I don't know its name, but I'm sure someone will be able to identify it. It isn't tall. Is it Iris lutescens? That's the closest I could find on Google. Two: Two years ago, while visiting an open garden, I purchased a Galanthus (possibly nivali, I'm not sure) and two years later, this is how far it has grown. I bought only one (which is something I nearly always do with plant purchases) as I wasn't sure how it would cope in my garden, especially in the heat and dryness of summer, but I planted it under the silver birches, and whilst it couldn't be said that it has galloped away, it seems to be holding its own, albeit in a less than exuberant fashion. 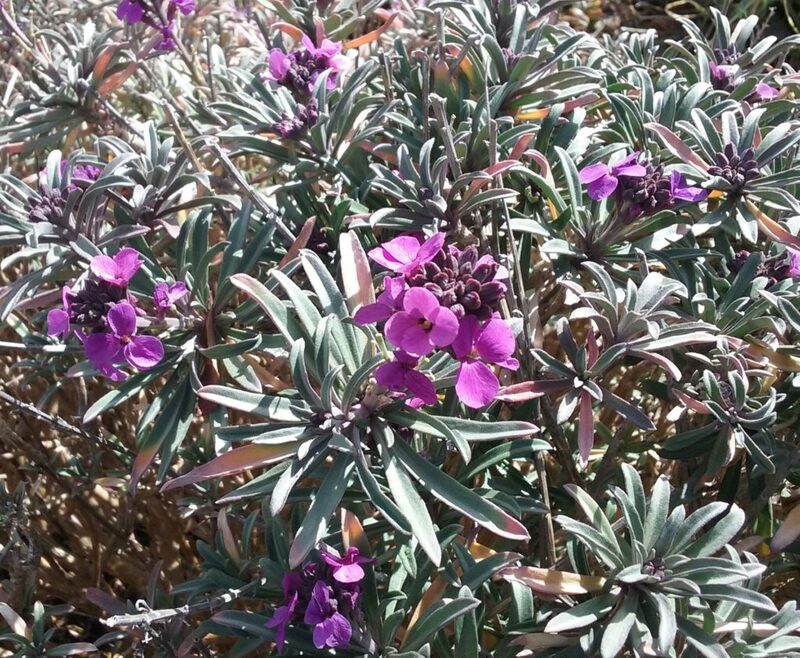 Three: Erysimum 'Bowles Mauve' is coming into flower. What a stayer this perennial wallflower is. It blooms for a very long time and although the shrub has a shortish life, it is easily propagated from cuttings. Four: Scilla peruviana which, despite its name, comes from the Mediterranean area. I have never grown these before, so I'm looking forward to seeing the flowers emerge. 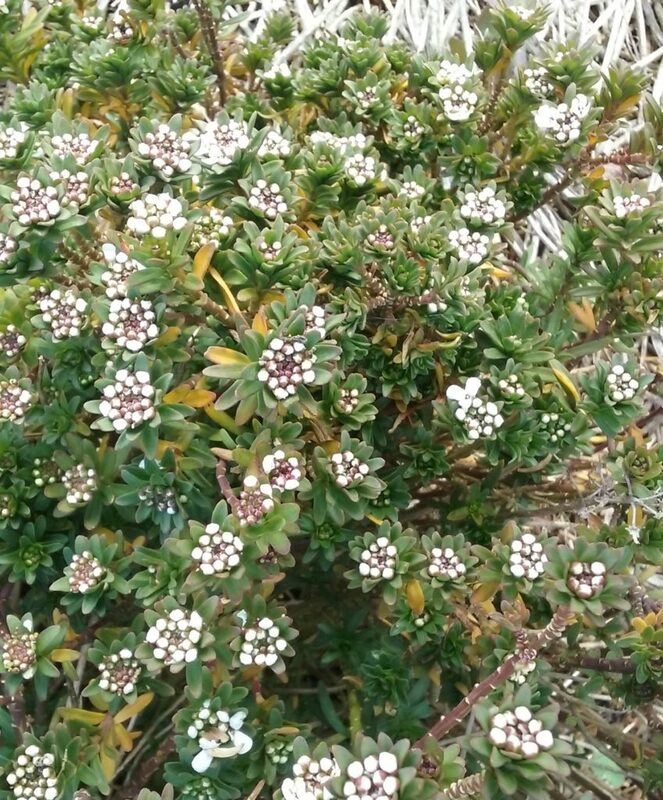 Five: Iberis sempervirens aka Candytuft. Another unpretentious and reliable early flowering plant. It isn’t fully out yet but in week or so it will be a mass of white flowers. 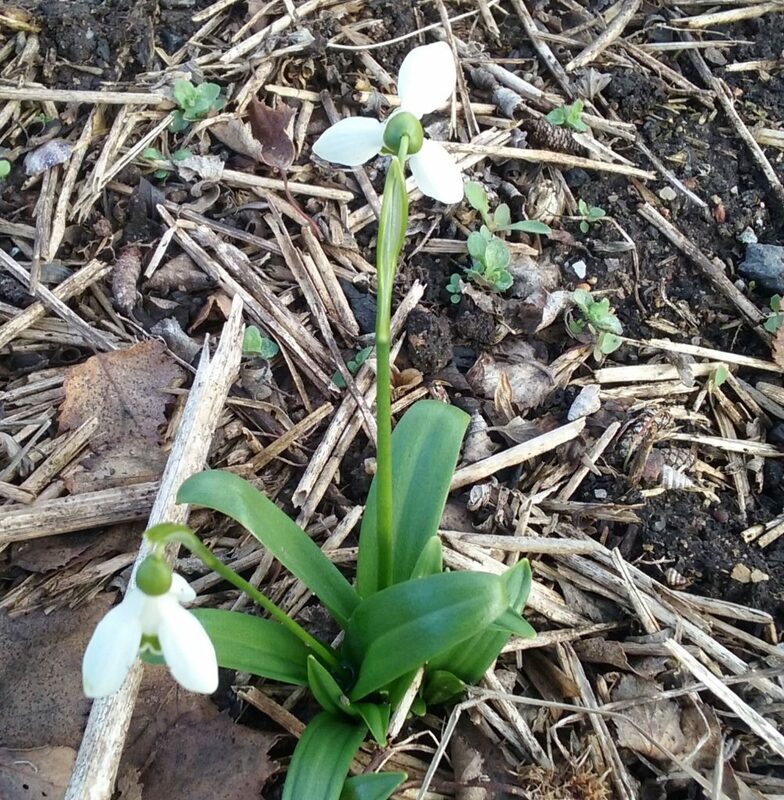 Six: These plants are much happier growing in our climate than Galanthus. They're Leucojum or snowflakes which are often confused with snowdrops. They're not nearly as desirable, but grow willingly and put on a good show. They're just appearing now. And that's my rather humble, wintry six for this week. As always, more sixes are to be found on the Propagator's blog. Do drop over and have a look at what other people are doing in their gardens. Weather here today: 4-16 C, partly sunny. This article did come through and just as well. I love all those early flowering plants. Perhaps it is colder here but at least the Manchurian Trees are already flowering despite having been severely trimmed back some weeks ago. We have a few early jonquils flowering and the ever faithful little violets. Each morning we both peer down to see what might surprise us next. 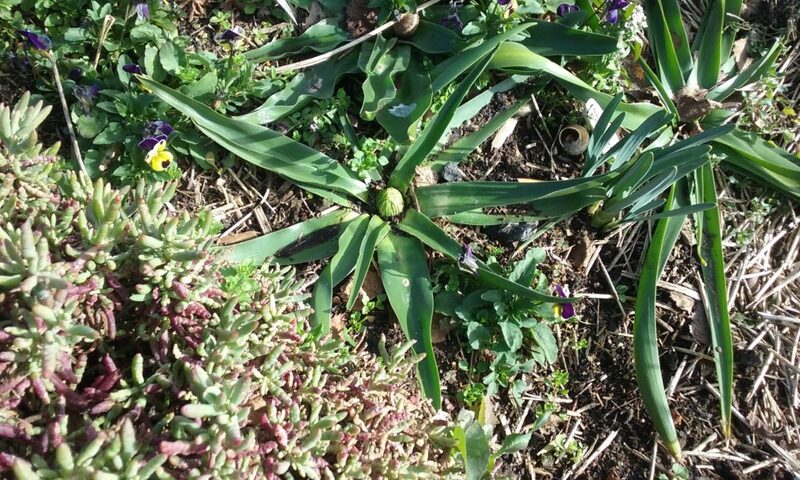 I’m surprised when bulbs start appearing as it always seems a little early. We have Manchuria Pears in the Main Street, and it won’t be long before they’re flowering, I think. How lovely to see those happy signs of spring, Jane, even if you are not out of the woods quite yet. I’m thrilled with the reminder about ‘Bowles Mauve’, one of my all-time favourites – I’m on a mission to find one to plant here now, I think it would go well. Not such good news about the drought situation, that sounds desperate. They are forecasting record European highs in southern Spain over the next few days, so very glad to be in the cooler, damper north. Enjoy your splash of spring! Thanks Lis. I think you’re very fortunate to be escaping that heat. By the sounds of things it’s extremely taxing for everyone. Lovely to see a little colour in your garden, Jane. I do so love the snow flakes. I’ve been quite shocked by how dry the country side is, and it is not even an El Nino period. Thank you Derrick, it’s such a terrible situation for farmers who are really doing it hard in this drought. It’s so fun to watch things come up and an exciting new discovery after a long winter. So sorry about your drought. Hopefully summer will bring you some much needed rain. It seems to be a problem everywhere this year. It’s such a great time in the garden, Cindy. Yes, everywhere seems to be suffering weather extremes of one sort or another and I fear that isn’t going to change. Your perennial wallflower is very pretty. It is years since I grew those, I had forgotten how good they looked. Nice Six-on-Saturday. Thank you! The wallflower is such a good doer and drought tolerant as well, which is a good thing. It seems odd to watch your garden wake up when we are still in mid summer, well late summer now I suppose and still not much rain here either. Thankfully we are not experiencing the kind of heat on the Iberian peninsula! One has to wonder how the climate will affect us all. Farmers here are already using winter feed and sending animals to slaughter early. That’s bad news about the farmers in your part of the world Jude. Not a good sign at all. The difference in hemispheres are always fascinating when it comes to gardening and it means that I’ve had beautiful flowers to look at and envy (benignly) during winter! I love all your bulbs and spring-ready blooms, Jane. Scilla peruviana is an intermittent bloomer here but it flowered well last year and its vibrant flowers are worth its occasional time-outs. I hate that you’ve had so little rain. That was our situation last year and my fear is that we’ll face more of the same this coming winter. Meanwhile, on the other side of the US, they’re getting record rain and the floods that come with them. Sigh. Thanks for your comment Kris. A harmonious kind of climate seems an almost forgotten dream these days, as we stagger from one extreme event to the next. This drought of ours has been developing for a long time now. We have access to town water, but I expect there will be restrictions before too long. Lovely spring flowers! The spring snow flake is the very first real wild flower in the forest here. My neighbours call it the snow piercer, as it so often comes up through February snow. Wonderful to see it flowering in Australia! Thanks Cathy. It seems not so very long ago that you were posting photos of spring flowers appearing. Hi Pauline, We had 4ml Saturday night…pitiful. It’s just enough to keep the garden going without watering while the temps are cold. August is statistically a dry month, so I’m not expecting much more. The situation on farms is dreadful. We’ve arrived back home from five weeks in Canada yesterday and, even though we knew it had been dry and cold, we were shocked to see how brown and bare the landscape is. I’m surprised anything has survived in our garden. The only positive is that even the weeds haven’t grown. Hopefully rain will come soon. Welcome home, Carol. I hope you’ll soon be writing some Canadian posts. 😊Fingers crossed for some rain. You’re right about those weeds and that’s some consolation. Thanks so much, Gill. It’s such an exciting time in the garden when everything starts to wake up. That’s a great description, thanks! Lovly to see your spring flowers. 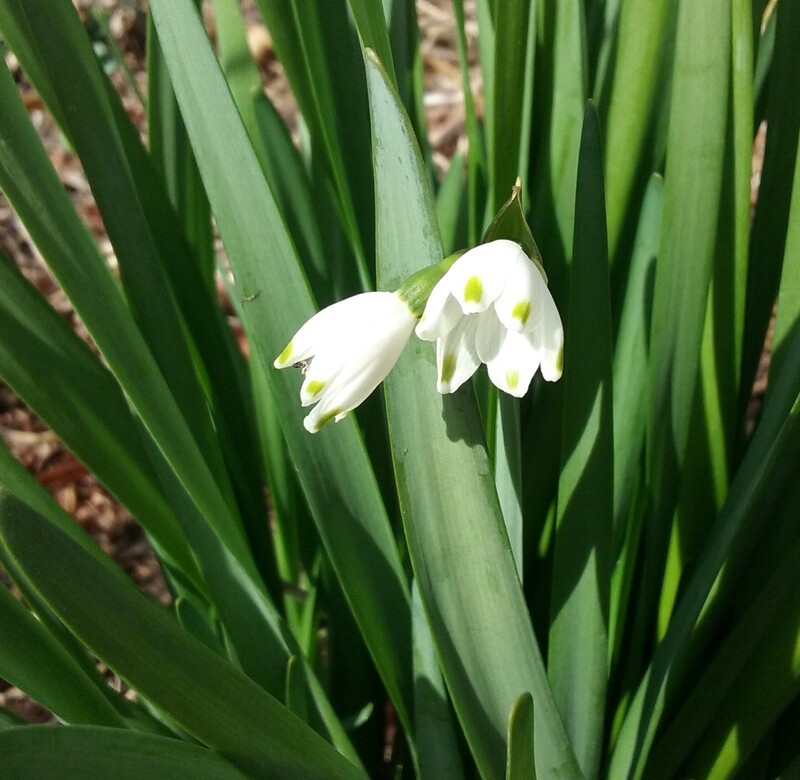 Your snowdrop looks more like Galanthus woronowii with its apple green leaves. Thank you for the identification, Chloris. I couldn’t remember which one I bought, and nivali was the one that came to mind. I’m more careful about keeping tags these days.